Eugene Tacitus, the aged court scribe, has been hauled out of bed and asked whom he worships. The answer – the living god-emperor Peppin 6 – turns out to be the wrong one; Peppin 6 is no longer living, having drowned in his bath. “Whoops,” says Tacitus, who is now given the choice of a painful heretic’s death or recanting and signing his allegiance (in triplicate) to the new god-emperor Peppin 7. He signs on the dotted line and wanders out into the light of a new regime. It’s that sort of humour that lightens an extremely dark story, because each new regime is the same as the old one. The god-emperor dies and is erased from history; the new queen of the god-emperor tortures her mother-in-law to death; the queen’s legitimate son becomes the new god-emperor; her illegitimate son plots his downfall. And no matter what they do, the common folk die like flies. Everyone, even the commoners, seems resigned to the point of boredom. But then something comes along to break the whole world out of its rut: a blue box with the Doctor and a new companion. 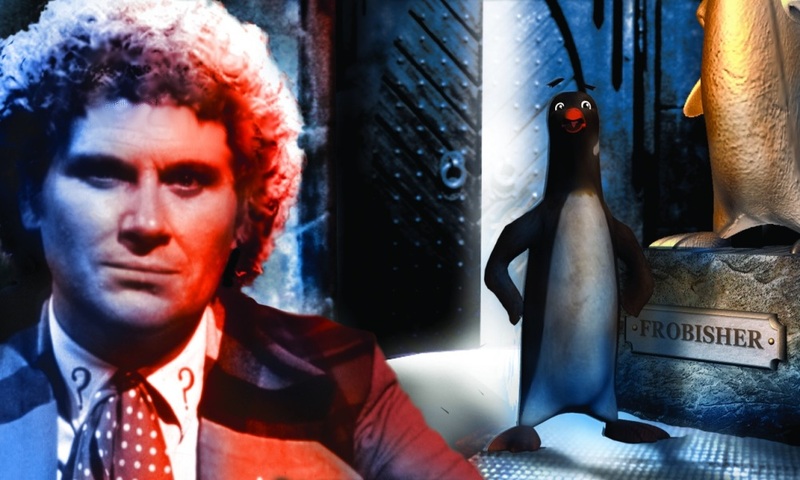 The flexibility of audio allows for Frobisher to jump from the Doctor Who Magazine comic strip – and it’s quite a jump, because he’s a shapechanger who likes the shape of a three-foot penguin. (In the liner notes, Robert Shearman points out that “he was clearly having the time of his life ludicrously disguised as a penguin travelling in a spaceship ludicrously disguised as a police box”.) As voiced by Jezek, Frobisher also likes to sound like a refugee from a Dashiell Hammett novel (and he’s going to even get to act out his detective fantasies in a later story, The Maltese Penguin). The presence of the new allows the characters to begin breaking out of their mold. Peppin 7 is terrified to be the new god-emperor, feeling neither godly nor leaderly. This doesn’t suit his queen, who snaps “Ever since we were married I’ve been waiting to be goddess to these stinking people and you’re not going to spoil it for me now!”. Everyone else has already found a new god-emperor – the Big Talking Bird and his little blue temple. Holy Terror is everything an audio can be. Not only is the story funny, frightening, and constantly shifting, it can incorporate things that would never work in video. It is also an excellent example of why gothic horror and Doctor Who blend so well together. If you are planning on listening to only a few Big Finishes, or if you were wondering where to start, The Holy Terror would be the perfect introduction. The Holy Terror (by Robert Shearman; starring Colin Baker, Robert Jezek) was released by Big Finish Productions in November 2000.